My first teaching jobs were teaching in a pair of schools (half time in each) where I saw students from kindergarten through eight grade. It was a great learning experience but I was happy to move on to high school after a year. Vicky Sedgwick has been teaching computer science to grades K to 8 for ten years now and has developed a great program. I was very pleased when Vicky agreed to answer a few questions for this interview series. WHERE DO YOU TEACH? WHAT SORT OF SCHOOL IS IT? I teach at St. Martin’s Episcopal School which is located in the Los Angeles area, specifically in the San Fernando Valley. It is a very small Preschool-8th Grade private, religious school. I teach Kindergarten-8th Grade. HOW DID YOU GET STARTED TEACHING COMPUTER SCIENCE? In the summer of 2007, the computer teacher at my youngest daughter’s school left and I agreed to take over the computer classes – at least until December. Well it’s now 10 years later and I’m still there even though my daughter moved on from the school years ago. When I started teaching the classes, they were focused on learning computer applications, learning to keyboard, and playing curricular related games. In a previous life, I had been a programmer and systems analyst so when I got bored watching students type for class after class and wanted to do more, I started to investigate what others were doing with programming and kids. Initially, I started with having my Middle School students do some coding in Scratch. 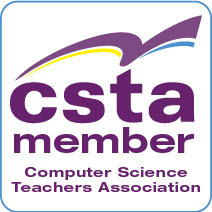 Then I found the CSTA 2011 standards and realized that I could be teaching all of my students about computer science and I had even been including some CS into classes already! That’s when I started adding more computer science to all the grades that I teach and each year has become more computer science and less other things. DESCRIBE THE COMPUTER SCIENCE CURRICULUM AT YOUR SCHOOL. WHAT COURSES DO YOU HAVE AND WHAT ARE THE FOCUSES OF EACH? At St. Martin’s, all Kindergarten through 8th grade students have class with me twice a week. Those classes focus on five main areas: Computer Science, Digital Citizenship & Literacy, Productivity Software (yes, I do still teach this), Computer Graphics / Computer Art, and Keyboarding (a small block of time at the beginning of the class to practice technique). We are on a quarter system at my school and at least one-quarter of the year for younger grades and about one-half of the year for older grades is devoted to Computer Science. I am lucky in that I can set my own curriculum which I try to scaffold each year based on what the classes have learned the year before, what new things are available, and this year, the new CSTA K-8 Standards that were released in July. I am really excited about using Micro:Bits and Circuit Playgrounds with my Middle School students and using some Raspberry Pis to teach networking concepts. I’m a “less me, more them” person as much as I can be. I do a lot of “flipped classroom” IN the classroom with tutorial videos that my students can watch if they need help rather than a lot of whole group lectures. I am also a big believer in students sharing their work. All classes have either a classroom blog (for K-2) or student websites (grades 3 and up) where students share what they are creating. WHAT IS THE BIGGEST CHALLENGE IN TEACHING CS AT YOUR SCHOOL? The biggest challenge is outdated equipment and lack of budget to update things. It is amazing what you can do with older equipment though and I like to think that I’m very good and coming up with solutions that cost little or no money. WHAT IS ADMINISTRATION’S SUPPORT (OR LACK OF SUPPORT) LIKE AT YOUR SCHOOL? My principal is great. She trusts me and lets me have control over the curriculum. She loves to tell the community what we are doing and makes sure to bring visitors to the lab to see what is happening there. HOW DO YOU MEASURE SUCCESS FOR YOUR PROGRAM? FOR YOUR STUDENTS? In the future, I want to look at how many students take a CS course in high school, if I can get that information for all of them. WHAT IS THE ONE THING YOU LIKE TO TALK ABOUT REGARDING YOUR PROGRAM THAT I HAVEN’T ALREADY ASKED? There is something truly special about being able to teach all students from Kindergarten through 8th grade. It is a real asset to modifying the curriculum to the needs of the students when you see all of them every year they are at the school. It really is gratifying to see the growth of the students throughout their time at our school. They amaze me every single year. LAST QUESTION. YOU’RE ONE OF THE KEY PEOPLE INVOLVED IN THE #CSK8 CHAT. CAN YOU TELL US ABOUT THAT? WHEN, WHY, WHO, ETC? Back in late 2014, Sheena Vaidyanathan, who was the K-8 Teacher Representative on the CSTA Board at the time, put together a K-8 Task Group for CSTA which included: Sheena, Todd Lash, Aung Nay, Laura Blankenship, Patrice Gans, Myra Deister, Irene Lee, and me. We were tossing around ideas of what we could do to bring together K-8 (ages 5-14) CS teachers and help to promote CS in K-8 (ages 5-14). Back when Patrice Gans was the K-8 Teacher Rep on the CSTA Board, she had hosted some #csk8 chats on Twitter and we decided to resurrect those. They started up again in January of 2015 and have been going ever since. The task group doesn’t actually exist anymore but the chat continues with a core group of people which includes Sheena, Todd, Grant Smith, and me. We are also having guest chat moderators more regularly. The live #csk8 chats currently happen on Twitter on the 1st and 3rd Wednesdays of each month at 5pm PT/8pm ET and cover topics of interest to K-8 (ages 5-14) teachers of computer science. We invite anyone who is interested in computer science for students ages 5-14 (you don’t have to be a K-8 CS teacher) to join us during the live chat or just follow the hashtag #csk8 at any time for posts about K-8 Computer Science. 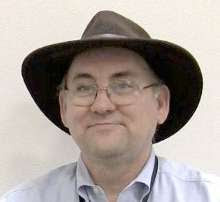 Note: The index for this interview series is at http://blog.acthompson.net/2017/10/computer-science-educator-interview.html and is updated as new interviews are posted.